It is notoriously resistant to radiation therapy and chemotherapy, although some cases respond to immunotherapy. The classic triad is hematuria (blood in the urine), flank pain and an abdominal mass. This "classic triad" is infrequently present when the patient first presents for medical attention. Renal cell carcinoma affects about three in 10,000 people, resulting in about 31,000 new cases in the US per year. Every year, about 12,000 people in the US die from renal cell carcinoma. It is more common in men than women, usually affecting men older than 55. Why the cells become cancerous is not known. A history of smoking greatly increases the risk for developing renal cell carcinoma. Some people may also have inherited an increased risk to develop renal cell carcinoma, and a family history of kidney cancer increases the risk. People with von Hippel-Lindau disease, a hereditary disease that also affects the capillaries of the brain, commonly also develop renal cell carcinoma. Kidney disorders that require dialysis for treatment also increase the risk for developing renal cell carcinoma. Gross examination shows a hypervascular lesion in the renal cortex, which is frequently multilobulated, yellow (because of the lipid accumulation) and calcified. Light microscopy shows tumor cells forming cords, papillae, tubules or nests, and are atypical, polygonal and large. Because these cells accumulate glycogen and lipids, their cytoplasm appear "clear", lipid-laden, the nuclei remain in the middle of the cells, and the cellular membrane is evident. Some cells may be smaller, with eosinophilic cytoplasm, resembling normal tubular cells. The stroma is reduced, but well vascularized. The tumor grows in large front, compressing the surrounding parenchyma, producing a pseudocapsule. 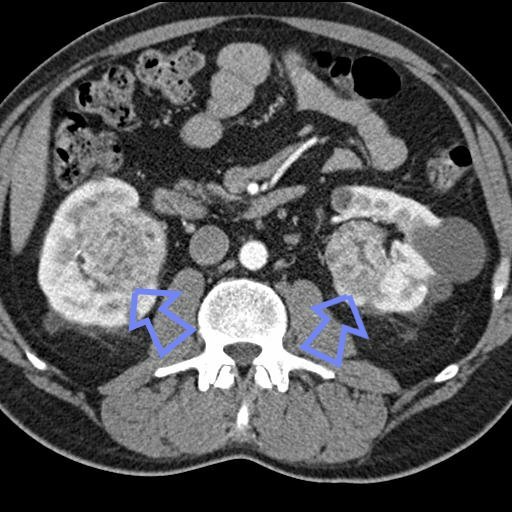 A 71-year-old woman who presented with left abdominal pain was found to have a noncalcified renal mass with a perisplenic extension on imaging studies. Histologically, the tumor showed predominantly malignant spindle cells with extensive osteoid and chondroid matrix production. Various growth patterns resembling rhabdomyosarcoma, malignant fibrous histiocytoma, and fibrosarcoma were also observed. Immunohistochemistry showed positive staining of the neoplastic cells for cytokeratin and focally positive staining for CD10 and CD117 (c-Kit). Electron microscopic examination revealed a poorly differentiated neoplasm with both mesenchymal and epithelial features. The tumor was diagnosed as a sarcomatoid renal cell carcinoma with overgrowth of the sarcomatoid component (World Health Organization: renal cell carcinoma, unclassified). To our knowledge, sarcomatoid renal cell carcinoma with such a broad morphologic phenotype in a single case has not been documented. Furthermore, the CD117 expression in a sarcomatoid renal cell carcinoma that was observed in this case merits further investigation. Sarcomatoid renal cell carcinoma represents a highgrade dedifferentiation of an epithelial neoplasm of the kidney. The prognosis is usually very poor. This phenotype can occur in all subtypes of renal cell carcinomas, including clear cell, papillary, chromophobe, and collecting duct carcinoma.1,2 Generally, the sarcomatoid components show features of malignant fibrous histiocytoma or fibrosarcoma. Heterologous differentiation such as chondrosarcoma-, osteosarcoma-, and rhabdomyosarcoma-like differentiation is rare.2,3 This report documents an unusual case of sarcomatoid renal cell carcinoma with not only extensive osteosarcoma- and chondrosarcoma-like differentiation, but also a wide spectrum of other sarcomatoid growth patterns. A 71-year-old woman presented to the emergency department at North Shore University Hospital with acute left upper quadrant abdominal pain. A pelvic computed tomographic scan and whole-body magnetic resonance imaging showed a large heterogeneous mass without calcification in the left kidney adjacent to the spleen and diaphragm. Preoperative whole-body bone scintigraphy detected no primary skeletal lesions. A left radical nephrectomy and splenectomy were performed. During the operation, the renal mass was found in the upper pole and extended to the spleen and part of the left hemidiaphragm. The radical nephrectomy specimen consisted of the left kidney and the left adrenal gland. 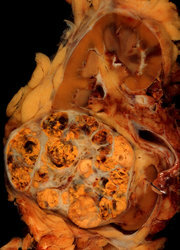 An 8 Ã— 6-cm whitish firm mass with central necrosis (Figure 1) was noted in the kidney. The mass completely replaced the upper pole of the left kidney and extended into the perinephric adipose tissue. Tumor implants were noted approaching the left adrenal gland. The renal pelvis, calyces, and renal vein were grossly uninvolved. The splenectomy specimen consisted of a spleen, a segment of pancreas, and a diaphragm connected with a 14 Ã— 12 Ã— 3.5-cm soft mass. This soft mass showed focally solid nodular areas and extended into the hilum of the spleen. Cut surfaces showed a similar gross appearance to the left kidney mass. The parenchyma of the spleen and pancreas were uninvolved. Histologically, both the renal mass and the perisplenic mass displayed a highly anaplastic spindle cell neoplasm with an extensive production of osseous as well as a chondroid matrix. The neoplastic matrix was intermingled with poorly differentiated, pleomorphic tumor cells (Figure 2, A and B). Mitotic figures and apoptotic bodies were frequently encountered. Various growth patterns were observed, including areas resembling malignant fibrous histiocytoma (Figure 2, C), rhabdomyosarcoma (Figure 2, D), and fibrosarcoma (data not shown). Some areas displayed a perivascular and myxoid configuration (data not shown). Despite extensive sampling (31 blocks from the renal mass and 18 blocks from the perisplenic mass), a definite epithelial component was not histologically evident. As shown in Figure 3, immunohistochemically, the tumor cells adjacent to the osseous and chondroid matrix were positive for cytokeratin (Figure 3, A). Tumor cells that grew around vessels showed the most intense cytokeratin staining. Faint staining for epithelial membrane antigen was also found (data not shown). CD10, a glycoprotein expressed on the brush border of renal tubular epithelial cells,4 was observed in some sections (Figure 3, B). The mesenchymal marker vimentin was diffusely positive in the tumor cells (data not shown). Staining for cKit (CD117) was principally cytoplasmic, with a focal membranous component that was noted in some large malignant cells adjacent to the osteoid matrix or vessels (Figure 3, C). Electron microscopy showed tumor cells with cytoplasmic glycogen and lipid adjacent to an osteoid containing a collagenous matrix (Figure 4, A). Small symmetric junctions were noted between occasional tumor cells (Figure 4, B). Sarcomatoid dedifferentiation in a renal cell carcinoma is independent of the histologie subtype and signals an ominous prognosis.1,2 The most common Sarcomatoid components observed in sarcomatoid renal cell carcinoma exhibit features of malignant fibrous histiocytoma or fibrosarcoma. Five large case study series of sarcomatoid renal cell carcinoma (a total of 210 cases) showed only 4 cases with osteosarcoma-like differentiation.2,5,8 An additional 3 cases were recently described.3,9,10 Reported cases with heterologous differentiation in sarcomatoid renal cell carcinoma are summarized in the Table. The present case is unique in several aspects. The sarcomatoid component dominated the histologie picture, and the diagnosis of sarcomatoid renal cell carcinoma required ancillary immunohistologic and electron microscopic studies. This case also shows an unusually large spectrum of histologie features resembling osteosarcoma, chondrosarcoma, rhabdomyosarcoma, malignant fibrous histiocytoma, and fibrosarcoma. To our knowledge, sarcomatoid renal cell carcinoma with this spectrum of heterogeneous phenotypes has not been previously documented. Furthermore, expression of CD117 was observed in the cytoplasm of the malignant spindle cells (ie, the sarcomatoid element) when polyclonal anti-c-Kit antibody (Dako Corporation, Carpinteria, Calif) was applied. The granular cytoplasmic pattern observed in this case has also been found in gastrointestinal stromal tumors and other tumors.11,12 Castillo et al11 recently published their investigation of c-Kit expression in sarcomatoid renal cell carcinoma. In their 215 cases of renal cell carcinoma, 19 were sarcomatoid renal cell carcinoma; 18 (94.7%) of the 19 cases showed c-Kit expression in the sarcomatoid component. Of the 18 positive cases, 13 showed strong cytoplasmic positivity. Five cases showed nuclear c-Kit localization, but none showed an exclusively membranous localization. It is well known that c-Kit is a transmembrane receptor tyrosine kinase.11,12 Variable subcellular localization of c-Kit in many tumors such as sarcomatoid renal cell carcinoma might indicate a different activation mechanism in tumor cells. Sarcomatoid renal cell carcinoma dominated by a sarcomatoid component can be a diagnostic challenge. Primary osteosarcoma of the kidney and metastatic osteosarcoma, including a direct extension of an extraskeletal retroperitoneal osteosarcoma to the kidney, should be excluded. Both primary osteosarcoma of the kidney and extraskeletal retroperitoneal osteosarcoma are very rare.13,14 Only 27 cases of primary renal osteosarcoma13 have been reported since it was first described in 1936. In a sarcomatoid malignancy of the kidney, immunologie reactivity for cytokeratin, or epithelial membrane antigen, leads to the consideration of sarcomatoid renal cell carcinoma rather than primary osteosarcoma of the kidney.15 Without any bone lesion on the imaging studies, a metastatic osteosarcoma to the kidney is an unlikely diagnosis. In summary, we report an unusual case of sarcomatoid renal cell carcinoma with extensive chondrosarcoma- and osteosarcoma-like differentiation in addition to a variety of sarcomatoid growth patterns. The malignant epithelial component was difficult to recognize and required immunohistochemical and electron microscopic studies. In light of successful c-Kit (CD117) target treatment on gastrointestinal stromal tumors,11,12 it would be interesting to further explore the significance of the CD117 expression observed in sarcomatoid renal cell carcinoma. We thank Myron Susin, MD, Associate Professor of Clinical Pathology, New York University School of Medicine and Department of Pathology, North Shore University Hospital, for his advice and assistance. 1. EbIe JN. Renal cell carcinoma, unclassified. In: EbIe (N, Sauter G, Epstein Jl, Sesterhenn IA, eds. Pathology and Genetics of Tumours of the Urinary System and Male Genital Organs. Lyon, France: IARC Press; 2004:43. World Health Organization Classification of Tumours; vol 7. 2. de Peralta-Venturina M, Moch H, Amin M, et al. Sarcomatoid differentiation in renal cell carcinoma: a study of 101 cases. Am j Surg Pathol. 2001:25:275-284. 3. ltoh T, Chikai K, Ota S, et al. Chromophobe renal cell carcinoma with osteosarcoma-like differentiation. Am J Surg Pathol. 2002;26:1358-1362. 4. Avery AK, Beckstead J, Renshaw AA, Corless CL. Use of antibodies to RCC and CDIO in the differential diagnosis of renal neoplasms. Am Surg Pathol. 2000:24:203-210. 5. Farrow GM, Harrison EG Jr, Utz DC. Sarcomas and sarcomatoid and mixed malignant tumors of the kidney in adults-part III. Cancer. 1968:22:556-563. 6. DeLong W, Grignon Dj, Eberwein P, Shum DT, Wyatt JK. Sarcomatoid renal cell carcinoma: an immunohistochemical study of 18 cases. Arch Pathol Lab Med. 1993:117:636-640. 7. Wick MR, Swanson PE. Carcinosarcoma: current perspectives and a historical review of nosological concepts. Semin Diagn Pathol. 1993:10:118-127. 8. Ro JY, Ayala AG, SeIIa A, Samuels ML, Swanson DA. Sarcomatoid renal cell carcinoma: clinicopathologic: a study of 42 cases. Cancer. 1986:59:516-526. 9. Saw KC, Ball RY, Khan NH, Pilling JR, Eaedley I, Ashken MH. Renal cell carcinoma with osteosarcomatous differentiation simulating staghorn calculus: a case report and literature review, y Urol. 1994;151:1607-1609. 10. Daneshmand S, Chandrasoma S, Lum C. Sarcomatoid renal cell carcinoma with massive osteosarcomatous differentiation: an unusual image in clinical urology. Urology. 2003;61:1031-1032. 11. Castillo M, Petit A, Mellado B, Palacin A, Alcover JB, Mallofre C. C-kit expression in sarcomatoid renal cell carcinoma: potential therapy with imatinib. Urol. 2004;171:2176-2180. 12. Smithey BE, Pappo AS, Ashley Hill D. c-Kit expression in pediatrie solid tumors: a comparative immunohistochemical study. Am J Surg Pathol. 2002;26: 486-492. 13. Leventis AK, Stathopoulos GP, Boussiotou AC, Papadimitriou KP, Kehayas PC. Primary osteogenic sarcoma of the kidney: a case report and review of the literature. Acta Oncol. 1997;36:775-777. 14. Sordillo PP, Hajdu Sl, Magill CB, et al. Extraosseous osteogenic sarcoma: a review of 48 patients. Cancer. 1983;51:727-734. 15. O'Malley FP, Crignon DJ, Roderick Shepherd R, Marker LA. Primary sarcoma of the kidney: report of a case studied by immunohistochemistry, electron microscopy, and DNA flow cytometry. Arch Pathol Lab Med. 1991;115:1262-1265. Accepted for publication March 31, 2005. From the Departments of Pathology (Drs Li, Teichberg, and Chen) and Surgery (Dr Steckel), North Shore University Hospital, North Shore-LIJ Health System, Manhasset, NY. Reprints: Qiang-hua Chen, MD, Department of Pathology, North Shore University Hospital, North Shore-LIJ Health System, Manhasset, NY 11030 (e-mail: qchen3662@yahoo.com).